Need relief from your Premenstrual (PMS) Symptoms? Most individuals who menstruate experience and understand the burden of PMS pain, but did you know it can be managed using natural solutions? Read more about natural treatments for your PMS. You can also visit Annex Naturopathic Clinic, where our team of naturopathic doctors can help you find natural solutions for PMS. We are a team of women who understand PMS and want to help you say goodbye to this bothersome group of symptoms. Premenstrual syndrome, also known as PMS, describes a group of symptoms that people who experience menstruation experience before the start of their monthly cycle. Depending on your individual makeup, these changes could be subtle, mildly frustrating, up to debilitating. Generally, PMS symptoms will be relieved by the start of the menstrual flow. If you suffer from PMS you may experience a range of symptoms. It's common for individuals who menstruate to have a combination of these symptoms, but you may experience one more extremely than the other. The type and severity of PMS symptoms can change from cycle to cycle, with one cycle exhibiting no symptoms at all, to moderate-severe symptoms during the next cycle. 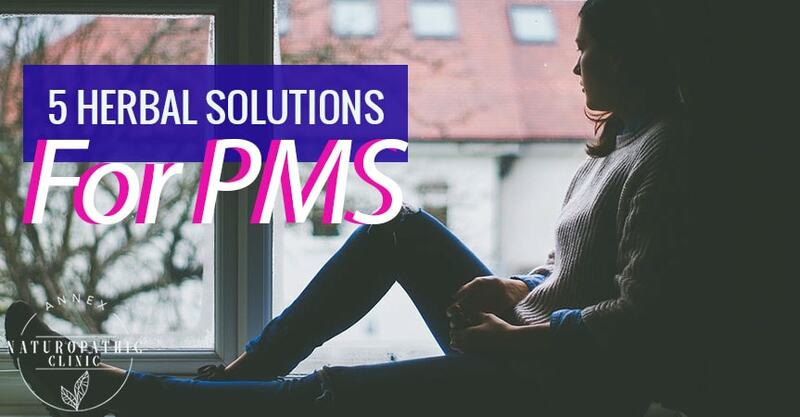 Causes and severity of PMS can be linked to hormonal fluctuations that occur during a typical menstural cycle and the impact of these changes on the entire body. Hormone and neurochemical imbalances can play a large role in the severity of PMS symptoms one may experience. There are also pre-existing health conditions that have been linked to the incidence of PMS - If you're prone to migraines, or have asthma or environmental allergies, you may be more prone to PMS symptoms. One of the most common modalities NDs use to manage PMS symptoms is through herbal medicine. It is a natural anti-inflammatory herb that can help treat PMS. 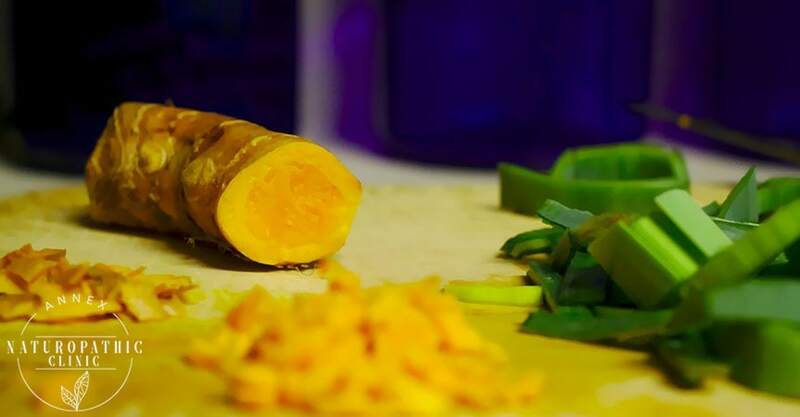 In particular, PMS symptoms like mood swings and cramping have been found to be relieved with the help of curcumin. Chasteberry is a shrub that grows in Central Asia and in parts of Southern Europe and is one the most common herbs used to treat generalized PMS. It's often used when PMS symptoms stem from low progesterone during the luteal phase of the menstrual cycle. Chasteberry may help with your bloating and cramping, and can lessen/minimize your food cravings. St. John's wort is an anti-inflammatory flowering plant that has been used medicinally for centuries. The ancient Greeks used St. John's wort to treat mood disorders and it continues to be used to treat anxiety and depression, symptoms often experienced during the PMS time. A 2010 study in the journal CSN Drugs revealed that St. John's wort could help with common physical and behavior PMS symptoms. Evening primrose oil comes from the seeds of the primrose plant. Primrose oil is high in essential fatty acids, particularly the anti-inflammatory omega-6 fatty acid GLA. Evening primrose oi has been found to help ease feelings of depression and relieve breast tenderness, swelling, and bloating commonly experienced during PMS. Ginkgo biloba is one of the oldest tree species on Earth and can actually be found in abundance here in Toronto. You'll find plenty of them growing along the streets here in the Annex and in Parkdale and along the Don Valley, but they can be seen just about anywhere in the city. You can spot them due to their distinctive fan-shaped leaves, which is where most of its medicinal properties are found. As shown in a 2009 study from the Journal of Alternative and Complementary Medicine, gingko biloba can reduce the severity of PMS symptoms. If you're experiencing PMS or PMDD symptoms, or you have other frustrations related to your monthly cycle, call us here at Annex Naturopathic. You'll have a chance to sit down with one of our licensed naturopathic doctors who will take the time to listen to your concerns, understand your options, and put together a treatment plan that works for you. Naturopathic treatments are available which may help ease your PMS symptoms. Contact Annex Naturopathic today to find out more.